Atelectasis is the collapse of part or, much less commonly, all of a lung. 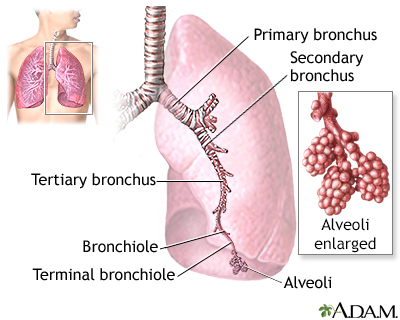 Atelectasis is caused by a blockage of the air passages (bronchus or bronchioles) or by pressure on the outside of the lung. Atelectasis is not the same as another type of collapsed lung called pneumothorax, which occurs when air escapes from the lung. The air then fills the space outside of the lung, between the lung and chest wall. Atelectasis is common after surgery or in people who are or were in the hospital. There are no symptoms if atelectasis is mild. The goal of treatment is to treat the underlying cause and re-expand the collapsed lung tissue. If fluid is putting pressure on the lung, removing the fluid may allow the lung to expand. Clap (percussion) on the chest to loosen mucus plugs in the airway. Deep breathing exercises (with the help of incentive spirometry devices). 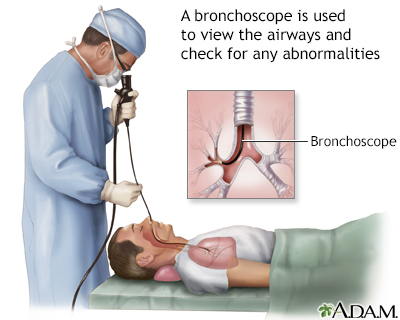 Remove or relieve any blockage in the airways by bronchoscopy. Tilt the person so the head is lower than the chest (called postural drainage). This allows mucus to drain more easily. Treat a tumor or other condition. Turn the person to lie on the healthy side, allowing the collapsed area of lung to re-expand. Use inhaled medicines to open the airway. Use other devices that help increase positive pressure in the airways and clear fluids. 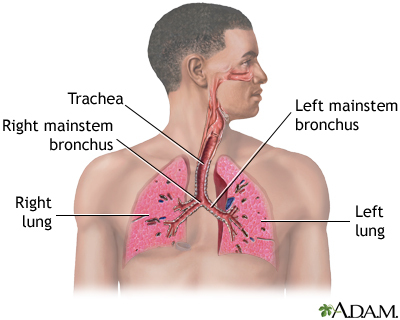 In an adult, atelectasis in a small area of the lung is usually not life threatening. The rest of the lung can make up for the collapsed area, bringing in enough oxygen for the body to function. Large areas of atelectasis may be life threatening, often in a baby or small child, or in someone who has another lung disease or illness. The collapsed lung usually reinflates slowly if the airway blockage has been removed. Scarring or damage may remain. The outlook depends on the underlying disease. For example, people with extensive cancer often don't do well, while those with simple atelectasis after surgery have a very good outcome. Pneumonia may develop quickly after atelectasis in the affected part of the lung. Call your health care provider right away if you develop symptoms of atelectasis. Encourage movement and deep breathing in anyone who is bedridden for long periods. Keep small objects out of the reach of young children. Maintain deep breathing after anesthesia. Carlson KH, Crowley S, Smevik B. Atelectasis. In: Wilmott RW, Deterding R, Li A, et al. Kendig's Disorders of the Respiratory Tract in Children. 9th ed. Philadelphia, PA: Elsevier; 2019:chap 70. Nagji AS, Jolissaint JS, Lau CL. Atelectasis. In: Kellerman RD, Bope ET, eds. Conn's Current Therapy 2018. Philadelphia, PA: Elsevier; 2018:pp 793-794. Rozenfeld RA. Atelectasis. In: Kliegman RM, Stanton BF, St. Geme JW, Schor NF, eds. Nelson Textbook of Pediatrics. 20th ed. Philadelphia, PA: Elsevier; 2016:chap 408.